Wasp Removal – Keep safe, let the experts handle it! PestAway technicians are trained and licensed to safely remove wasps and their nest from your property. We service all Melbourne suburbs and pride ourselves on our environmentally friendly proven solutions. Wasps are renown for their aggressive behaviour. In particular, disturbances to the nest can cause wasp attacks. Wasps can sting repeatedly and mark their victim with a chemical signal which in turn attracts other wasps. Not only are stings painful, it is well documented that 10% of victims can be allergic to wasp stings. This poses a significant risk to health and safety, especially if stung around the mouth and throat. For these important reasons, it is highly recommended to seek professional pest control advice and service. It is common for the wasp nest to be built in sheltered locations such as within a cavity, hole, roof space etc. An established wasp nest will have a constant stream of wasps leading to and from the nest. Uncovering the exact location of a wasp nest may require a short period of observation. Wasps use dead wood as a building material to construct their nest. They chew the wood and mix it with their saliva creating a paper mache looking nest. Wasps are hunter gathers and it is common to find nests close to human activity. Humans provide an accessible food source particulary the sweet varieties. Nests disturbances can set off aggressive wasp behaviour. 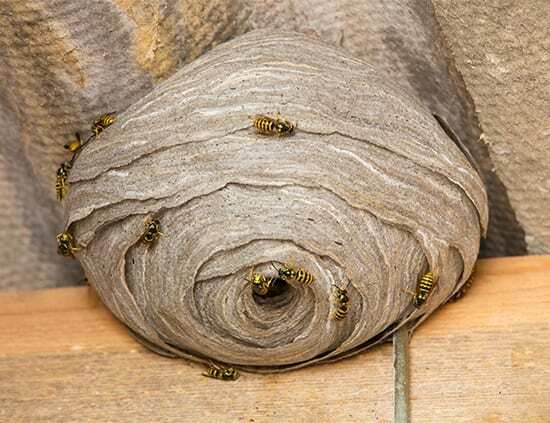 PestAway offers professional wasp nest removal and pest control services. You can reduce the wasp population in and around your home by following some simple measures. Be sure not to leave food or drink uncovered outside. Avoid leaving pet food lying around. Cover outdoor rubbish bins. Pick up fallen fruit. Outdoor picnic and barbecues can attract wasps so make sure to cover food. Check food containers and avoid drinking from a can or a bottle. Call a professional Pest Control Expert to locate and remove the nest. A European wasp sting causes a painful burning sensation that leads to localised redness and inflammation. Whilst the majority of sting victims do not experience serious problems, research shows that 1 in 10 can experience serious allergic reactions. Of particular concern is a life threatening anaphylaxis or localised stings that cause swelling and obstruction of the airways. Symptoms of swelling around the airways or signs of anaphylaxis require immediate medical attention. For regular stings, the recommendations are to wash the area with soap and warm water. A cold pack can be used to alleviate swelling coupled with pain relieving medications and creams. For prolonged swelling you may wish to consult with your doctor or pharmacist. An antihistamine may be beneficial.